Today i will tell you about a new site to earn a decent money through net and this new site only associates with the Indians and only pay to Indians and the best think is that anybody can earn from this site its not necessary to be a blogger to earn from this site, so you can also earn with this awesome site very easily. 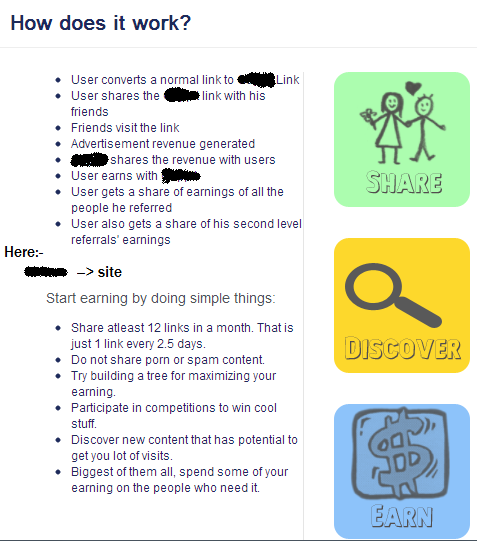 This site will open a new path of earning for all Indian bloggers , its a high paying and low payout (redeem) site. and this is free to join means it doesn't need any investment or don't have any hidden costs . Now you will be curious to know that how to earn with this site or why the site will pay you ,so guys to earn with this site you have to simply convert your link to there site link and just share it with friend or any where on internet now whenever a person or friend will open your link you will get money for it. you can say that its work on the basic principle of shortening link sites like adf.ly and cashfly etc. as the bloggers where quit friendly with this type of sites and as we all know that adf.ly is banned by DoT and they are also planning to ban other shortening sites. so this sites will be the best alternative . if you have any doubt you can see below image to understood well. While the other adf.ly or cashfly gives Rs 78.6($ 1.26) for 1000 unique visitors. This site gives payout of Rs. 300 and they give by cheque that you don't need a account to other sites. While in other the you need to have an account and a mediator like paypal ,payza etc. Without Refferal link (Direct link) :- Link of Earning site without refferal. If you think or find this article a resourceful or useful for you then you can join us via social site for more updates and feel free to share this article on fb,twitter etc. your link: https://adf.ly/RB0VO is not working. please provide the link. I would recommand the one of the best websites that you forgot to post here it is purebits.net pay per download network.